The United States Congress designated the Popo Agie Wilderness (map) in 1984 and it now has a total of 102,620 acres. All of this wilderness is located in Wyoming and is managed by the Forest Service. The Popo Agie Wilderness is bordered by the Bridger Wilderness to the west. This rough land features high, jagged peaks; deep, narrow valleys and canyons; sheer granite walls; cirque basins; talus slopes; and perennial snowfields. This area abuts the Continental Divide and encompasses 25 square miles of the southern Wind River Mountain Range. 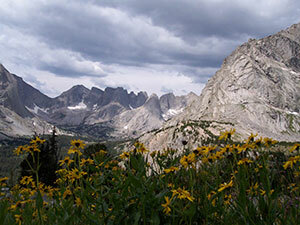 Along the western boundary, which the Popo Agie (pronounced "po-po-zsha") Wilderness shares with the Bridger Wilderness, stands Wind River Peak, at 13,255 feet the highest point in the area. More than 20 other summits rise above 12,000 feet. The lowest elevation in the Popo Agie is the Middle Fork of the Popo Agie River at 8,400 feet on the eastern boundary. Bordering the north side is the Wind River Indian Reservation, outstanding country where visitors must first obtain a permit before entering. More than 300 alpine and subalpine lakes and ponds send their waters down sparkling streams and over waterfalls to the Middle Fork and North Fork of the Popo Agie River and the South Fork of the Little Wind River. All the water eventually ends up in the Wind River. Forests of lodgepole pine and Douglas fir, Engelmann spruce, and subalpine fir grow here. In a Smithsonian Institute report issued in 1879, it was said of the Wind River Mountains, "when a good Indian dies, he falls into a beautiful stream of bright, fresh water, and is carried to the pleasant grounds [of the Winds]. . . . " The temperature rarely exceeds 80 degrees Fahrenheit, but it may plunge to 40 below zero in the winter. Snow may fall any day of the year. During summer, there are occasional heavy rains and afternoon thunderstorms are common. Many miles of trails attract a relatively large number of visitors, which has led to resource-protecting restrictions on camping and travel. Check with the Washakie or Wind River Ranger Districts (located in Lander and Dubois, respectively). Planning to Visit the Popo Agie Wilderness? How to follow the seven standard Leave No Trace principles differs in different parts of the country (desert vs. Rocky Mountains). Click on any of the principles listed below to learn more about how they apply in the Popo Agie Wilderness.